This first ever visit to the Belpaese was an important event, because it represented the end of decades of animosity between the two countries. In fact, formerly part of the Ottoman Empire, Libya was occupied by Italy in 1911, before becoming officially its colony in the 1930s. The country gained independence in 1951. The visit had at its basis serious issues such as the treaty signed by Silvio Berlusconi and Muammar Ghaddafi in 2008, in which Italy profused apologies for colonial era abuses and agreed to pay a 5-billion-U.S.-dollar compensation agreement to make amends for Rome’s 1911-1941 colonial rule. In return Italy had benefits obtaining greater rights to Libyan oil and gas and the consent for Italian navy patrols off the Lybian coasts to block the boats of clandestine immigrants across the Sicily channel. Despite the peaceful intentions of the visit, though, the visit of the Libyan leader was full of polemic attitudes created by both sides. First of all, since his arrival at the Ciampino airport, Muammar Ghaddafi showed well on display on his uniform, together with all his military decorations, a picture of a legendary resistance hero, Omar al-Mukhta, whom Italians occupiers hanged in 1931. This visual provocation was apparently denied through words, as the Libyan leader during the official meetings hailed the former colonial ruler for apologizing for its past. Another problem was created by the unusual accommodation of Muammar Ghaddafi who has the habit to pitch a Bedouin-style tent in every capital he visits. The chosen location was the XXVII’s century Villa Doria Pamphili park and this decision stirred up the reactions of the residents in that area, who could not accept to live, even though only for a few days, in a quarter paralyzed by a tight security blocking every activity around Ghaddafi’s portable chateau. The most upset to find the park inaccessible were all those making a daily jogging and the many proprietors of dogs, who could not accept to change their daily schedule. 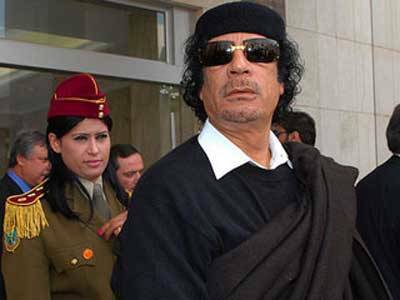 Ghaddafi was guarded during all his meetings by the so-called "Amazons," a group of several dozen well-outfitted female bodyguards from Tripoli, in green fatigues and red berets, who did not leave him alone for a moment. Even at the famous restaurant Il Bolognese in Piazza del Popolo where he arrived one evening, almost at ten, escorted by forty people, including bodyguards and assigned to ceremonial, among whom outstood the head of his Amazons who is with him round the clock. Colonel Ghaddafi ate in a small room that can contain ten people, while the rest of his train was sitting in tables out of the restaurant. Piazza del Popolo was closed to the public, stirring up protests of Romans and tourists there for a simple evening walk. In the meantime the Libyan leader was tasting the famous homemade tagliatelle and branzino cooked in the oven. Of course he also accepted to have photos with the proprietor of the restaurant, Alfredo Tomaselli. A planned address in the Italian Senate chambers was moved to a less prestigious setting, following similar complaints by opposition politicians. Another moment not particularly idyllic was when the Libyan leader, addressing Italians in the historic Piazza del Campidoglio, embarrassed his hosts by saying he would abolish political parties and give Italians direct power if it were up to him. “There would be no right, left or center. The party system is the abortion of democracy. I would abolish political parties so as to give power to the people.” His words made angry his host, right-wing Rome mayor Gianni Alemanno, who had praised Ghaddafi an hour earlier. Alemanno told the journalists present in the square that the Libyan speech on political parties was “unacceptable” and that “we don’t accept lessons on democracy from anyone.” The mayor’s disappointment probably grew also after Ghaddafi’s praise of Italy for condemning fascism after the colonial period. Was it a gaffe or a missed information by the leader’s staff, forgetting that Alemanno, standing beside him, was once the youth leader of a neo-fascist party? Among the “incidents” during this rather controversial and, indeed, never boring visit, there was the missed meeting with Gianfranco Fini, the President of Italy’s Parliament who, after having waited for two hours the Libyan host for a roundtable, decided to leave: “There is no justification. You just don’t do it,” the upset Fini said. Silvio Berlusconi too met Colonel Ghaddafi appearing rather sober, compared to his counterpart. He was received in the tent in Villa Pamphili, where they exchanged gifts of jewelry and silver and where the Italian premier was praised as a man who would be a great Libyan President. On the last day of his visit, Ghaddafi had a meeting with Italians expelled from Libya in 1970, after he took power, even though the Jewish community who fled the country refused to meet him on the Sabbath. It was a first-ever visit leaving controversial judgments on the Libyan leader and the regret of the many supporters of the A.S. Roma soccer team, who were looking at the visit as a possibility for their team to be bought by the wealthy Colonel and that had created groups of fans following his schedule, making him feel loved through choirs composed for the occasion. At least…a positive note, afterall…..